Ranbir Kapoor and Anurag Basu can’t be any more different from Salman Khan and Kabir Khan even if they tried, but there’s one thing which connects them. And that is their persistence to repeat the magic of their previous film by maintaining the tone and nature of it in their next film. Whilst the Khans failed with Tubelight, can Basu and Kapoor reignite the flame of Barfi with another magical film in the form of Jagga Jasoos. Delays aside, the promos have promised an enthralling entertainer for the kids and the classes. Will Jagga Jasoos be able to rekindle the magic of Barfi? 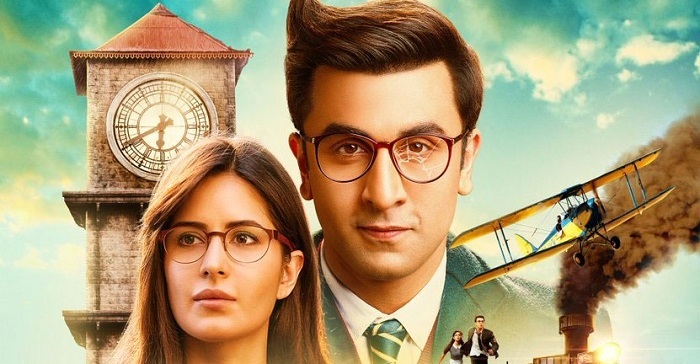 Story: Shruti (Katrina) is a teacher who tells the students in her class the story of a mysterious Jagga (Ranbir), who although a stammerer was an astute observer. We get to know about the man’s many childhood mysteries and about how he was brought up by a man called Badal Bagchi (Saswata Chatterjee). Jagga grows up and Badal goes missing. Jagga Jasoos then tumbles into a story of funny shenanigans involving the titular character and his nemesis in the form of a funny negative character played by Saurabh Shukla. Will Badal return? How does Shruti know Jagga and his stories so well? Does anything come out of their relationship? Watch the movie to find out. Screenplay and Direction: Anurag Basu has nailed it once again. Well, almost. He has come close to the surrealness of his previous film, and has managed to make Jagga Jasoos a rather entertaining film. Kids will lap this film up. The way he interludes the movie with so many songs because of the stammering of his lead character is novel. The idea is ballsy in itself but to go out there and actually execute it requires tremendous guts especially when faced with as many delays as they did. The pace of Jagga Jasoos takes some time to pick up but when it does, it reaches fever pitch. A lot of things happen in too little a time, which can get jarring eventually but the film holds on and makes for a good ride. And the emotions of the film work too, which might eventually make the film worth it for the families. Technically, Jagga Jasoos is a product of the highest order. It looks and feels like an international film, probably because of the involvement of Disney in the production department. The production design and costume design is professionally done and all the exotic locales that they visit give the film an international look and vibe. The editing holds back the film a bit because it can stretch on for too long and a duration of almost 3 hours can be quite tiring to sit through. The music of Jagga Jasoos doesn’t match the heights of Barfi, but they work well within the context of the film. Galti se Mistake, Phir Wahi, Jhumritaliya, Ullu ka Pattha and the other songs manage to make a mark for themselves in the movie. What an insane idea to do a musical like this in Bollywood by the makers and a better soundtrack may have made the film even more likable. But what’s there, that works too. Acting: There are very few superlatives which are left to be said about Ranbir Kapoor’s extraordinary talent by now and with Jagga Jasoos he reaches another career high. His performance is endearing, and his ability to make the viewer feel the emotional tangent of his character remains unmatched. All in all, Jagga Jasoos is another great performance by Ranbir Kapoor. Katrina Kaif has a difficult task on hand playing catch up with Ranbir and credit where credit is due, she holds up quite well. She emotes well and manages to say her lines without any hiccups or mishaps. The other actors in Jagga Jasoos are finely cast too, and play their part with aplomb. Saswata Chatterjee is in good form, and so is Saurabh Shukla in a role which is too reminiscent of his role in Barfi. But he excels nonetheless. Conclusion: Jagga Jasoos is an adventure unlike any in Bollywood before this. The movie has potential to make the kids go crazy (especially the last half an hour or so) but it might come at the expense of the adults not finding themselves attached to the fantastical nature of the story. Jagga Jasoos sets up a fantasy world and Anurag Basu doesn’t lose the emotional grip of his story even when the sets become grander and the frames become crazier. The film drags on a bit in the second half when too many characters are introduced but it all wraps up decently by the end. If you’re in the mood to let yourself be immersed in a desi fantasy, then go watch Jagga Jasoos. If you are easily offended by unbelievable events in movies, then Jagga Jasoos will come across as just a Tintin ripoff to you. Decide wisely. where did pritam copied the music from this time around? Who cares if sngs r ausm. Well, we will come to know about it very soon. By the way worry for JHMS??? WIll it be 5 th consecutive flop??? Indicine tries it all to present it as a piece of grandeur. Let’s see what the audience decides in the next 24hours. Weekend will be more than 40 crore. For the first time in a long time, I feel like indicine isn’t being biased in their review and you are talking up this nonsense like they are making it up..This looked like an awesome film from day 1.. Anyway i think dutt biopic is going to be a bug film for him bt if that flops its going to be a rough patch for him..have high hpoes from hirani bt he is getting repetetive and this time the subject is not also very safe…how many of you agree with me??? Review positive mile ya negetive.. Disaster krega hin… Lifetime 35-40 cr..
Ranbir is a big thing-he hould do Univeral movies. He actually commands a bigger fan following then Ajay and Akki at multiplexes but his films are restricting his audience and not appealing to his fans(Who want APKGK, YJHD). He should learn it and I am sure he will be back after Dutt. Earlier he’d said salman never experiments with new role / content ..sd when salman does something new critics gives 1 & half star to generate negativity n that ultimately affects business . Tublight wasn’t good but wasn’t that bad as explained from critics . Ranbir Kapoor is undoubtedly the best actor of this generation – solely coz he can distract you with his performance even if the movie isn’t good – ADHM being the best example. On the other hand, Ranveer (who is possibly 2nd best) needs a good script to be able to showcase his terrific acting skills (else he ends up with Befikre or Kill Dil type of performances) . That’s the difference. Hope Jagga works for him at the BO! Just watched it. Awesome movie. Beautiful world they have taken me to..
Not a big Tintin fan, but will catch this out. Anyways, can anyone tell me the best link/site from where I can download GOT all seasons till now? 3 * too much. Maximum 1.5 */5. First day will be 7-8 Cr. Life Time 55 Cr. Life time will be 55-60 crs verdict FLOP??? jagga jasoos musical adventure its multiplex audience movie i hope ranbir is back for career..
RANBIR & KATRINA is one of the best and also successful pair in Indian Cinema…..
Because of fans like you, films become flops and actors careers are ruined..
Word of mouth is mixed. Second half seems to be the issue. Occupancy has been very poor so far. This might turn out to be average or at the max above average – HIT is very difficult.